Autumn is the Best Time to Install Plants! Finally the temperatures are bearable! It’s enjoyable to be outside in the landscape’s natural surroundings again instead of being inside escaping this summer’s debilitating heat. Autumn is the time we see plants going dormant for the winter. Evergreen plants stop producing new leaves and deciduous plant’s leaves drop. Although the landscape can look dreary in the fall, the cool temperatures are ideal for adding new plants to your garden. You will not see new top growth until next spring, but the roots are growing and getting the plant established. It’s the perfect time to consider installing a planting phase of your landscape plan. November is the best month to plant trees and the fall is the only season you can plant many spring flowering bulbs like daffodils, tulips and hyacinths. Many of my client’s homes are in neighborhoods where deer are a problem. I am constantly searching for deer resistant plants that are interesting and new. Conifers are a group of plants that are diverse in color, texture and height. The needle like foliage is not appetizing to deer. They are good shrubs to use around the house or in free standing mulch beds. Some of my favorite conifers are Dwarf Japanese Cedar (Cryptomeria japonica’Globosa Nana’), Birdsnest Spruce (Picea abies ‘Nidiformis’), False Hinoki Cypress (Chamacyparis obtusa nana gracilis), Green Emerald Arborvitae (Thuja occidentalis’Green Emerald’) and Japanese Cryptomeria (Cryptomeria japonica ‘Yoshino’). The Dwarf Japanese Cedar is a soft, round shrub that grows at a slow rate to a mature height of 3-4’. 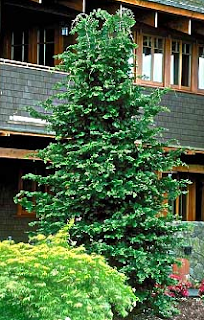 The Birdsnest Spruce is a dwarf shrub that grows to a height of 2-3 feet. It has a depression in the center and the branches radiate out from it giving the impression of a bird’s nest. The False Hinoki Cypress grows to a mature height of 7-8 feet and is a good plant to use to soften the corner of a house or hide a downspout. In this photo, the narrow growing Green Emerald Arborvitae is in the patio planters and Japanese Cryptomeria is used for screening behind the wall. The Japanese Cryptomeria has replaced the Leyland Cypress for the best tall evergreen screening plant. It does not have the fungal disease problems. The Green Emerald Arborvitae does not exceed a 3-foot width, so it is perfect for small spaces. Mulching is a late fall task that is very beneficial to your plants and soil. You have choices of what type you wish to use. The most common ones available for bulk use are hardwood, pine, cedar & cypress. I prefer shredded pine bark for a few reasons. Pine bark does not compact as much as hardwood, but stays open letting water travel through it easier. It does decompose faster than hardwood, but the addition of the organic matter to our regions heavy, clay soils enriches them. Hardwood ages to a gray color whereas pine stays brown. Although many of my clients use hardwood mulch because it lasts longer than pine, I only specify it for paths and slopes where the compaction is necessary to keep it in place. The cost of shredded pine bark and hardwood are comparable, but usually costs less than cedar and cypress. New planting beds receive a 3-inch layer of mulch initially. A 1 to 2-inch top dressing once a year should keep your planting beds looking their best, keep water from rapidly evaporating from the soil and keep the soil enriched and loose by adding organic matter. Apply mulch after your final clean up of the season or immediately after installing a new planting bed. As new grass seed germinates and existing grass is being revitalized, do your best to keep fallen leaves from piling up too deeply on it. The leaves keep the sun from reaching the grass and if allowed to stay on it too long can rot the new blades. Remember to fertilize this fall, so your grass is nice and full in the spring with strong, deep roots. I overseed my lawn a few times throughout the fall to fill in bare spots that just didn't germinate during the initial seeding. Please contact me to inquire about my landscape design and consulting services.